To my mind, Structures from Silence ranks highly in the list of ambient works that could be considered canonical. A defining work both in Roach’s career and in the genre itself, this timeless 1984 release has inspired countless electronic musicians–including, in retrospect, Steve Roach. That, aside from the improvements in sound quality the remastering offers, may be reason enough to get ahold of this 30th Anniversary re-release: to hear how the music continues to inspire the artist. Along with the three original long-form pieces, which are as beautiful and meditative as ever, there are two new releases inspired by their “soul tone,” and which emerge as very worth successors. “Suspension” and “Reflection” maintain the hallmark lightness of the original. The first eases its way slowly through on warm clouds of sound, so familiar that if you’re listening from one disc to the next, the flow is perfectly unbroken. The second glimmers appropriately, like sun on water, and passes through various moments of light and shadow without losing that sense. Roach plays with high tones here that sometimes border on sharp without going too far. “Beyond” and “Below” explore the flip-side of the Structures… sound-set, tending more toward Roach’s slightly darker musings. While still as soft and immersive as the rest of the release, these pieces eschew the higher tones and let low drones take the forefront. “Below,” particularly, brings the volume and brightness way down, almost to the point of just barely breathing in your ears. As much as I have always loved the feel of Structures, this is more the way I like my Roach–a little moody, decidedly pensive, and wrapped in the right amount of shadow. As for Structures itself, the piece has aged beautifully. I will always find the three-note phrase that makes up the title track a little breathtaking in its simplicity. The rise-and-fall cadence of the pads, with the slightest of pauses between, is as calming as ever. Since its initial release, this album’s resonance has been felt over and over in Roach’s work; it’s inspiring him still on releases like The Delicate Forever. And with good reason. In 1984, Structures from Silence arrived to change things, to point in new directions, and it’s clear that it has never quite left. 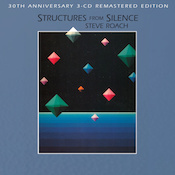 Available from Steve Roach’s web site.